The District is about to devour Kleptocracy. Arena Stage’s latest production, which runs through Feb. 24, is the world premiere of a play set in 1990s Russia that depicts the rise of Vladimir Putin (Christopher Geary) and his struggle for power against crude oil oligarch Mikhail Khodorkovsky (Max Woertendyke). Kleptocracy feeds the Trump-age hunger for stories of Putin and Russia but peers at them through the lens of history—yet it is artistically, analytically, and socially more clever and threatening than an appeal to popular opinion. When Putin meets with American representatives, he throws an eerie prophecy into the pseudo-historic scene. When he says, “Your president will be my dog,” the audience erupts in a coarse burst of laughter. Through vivid acting, striking images, and sly metaphor, Kleptocracy achieves and evokes what only theater can: a truth beyond reality. When Khodorkovsky thinks he’s made it—he’s about to be the wealthiest man in Russia—the protesting mayor, Vladimir Petukhov (Elliott Bales), enters the shared stage for a televised announcement of his hunger strike against Khodorkovsky’s treatment of workers and then, blurring the line between two settings, takes a seat at Khodorkovsky’s tea table. As Khodorkovsky and his wife Inna (Brontë England-Nelson) panic over news of the protest and fearfully discuss their options, the mayor is shot through the head, spattering the tea table—and Khodorkovsky himself—with crimson blood. The question remains: was Khodorkovsky culpable? Kleptocracy is wittily written and intensely acted. Comedic moments land amid political violence and scheming; lights rise over ironic snapshots set on the bloodstained floors of recent murder. We see Putin in every mode we could imagine: He arrives quietly in an 80s tracksuit, he reads us absurdist poetry, he appears in an apron to chop a bloody steak to feed a tiger and later lounges on a striped pelt. Geary presents a snarky, sarcastic, and deeply theatrical portrait of a ruler popularly regarded with terrified fascination. He touches the audience more intimately than any of the more sympathetic characters. As director, Jackson Gay has integrated a distinct female voice, challenging the standard for dry stories of men in power. Broadway actress Candy Buckley plays an unnamed, unspecified White House official who represents the entirety of the American influence and pressure points on Putin’s government and Khodorkovsky’s business, boldly holding her ground with a thick Texan accent. Like alchemy, Kleptocracy constructs stunning images from basic elements. 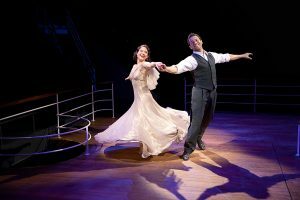 Set designer Misha Kachman, who previously designed for Georgetown’s Our Class, used similar design motifs for this show at Arena Stage. His industrial, geometric, grey set of angled walls and layered floors is a palette for lights and projections. 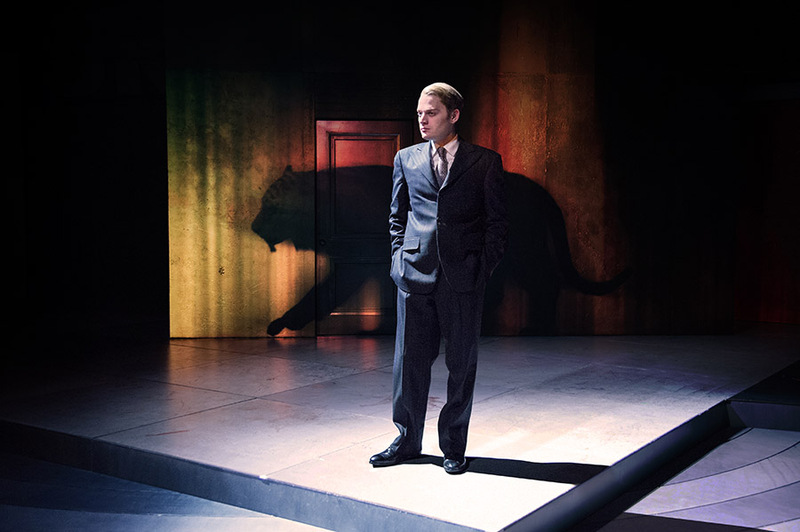 Through the set’s numerous doorways, lighting designer Masha Tsimring expertly directs angled side lighting to cast long, dramatic shadows—evoking tropes of Cold War espionage. 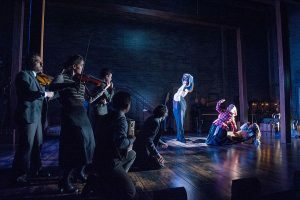 The lights and uncanny angles and designer Nicholas Hussong’s projections form a dreamlike atmosphere filled with fog, shadows, and dark corners, amplifying the characters’ calculated theatrics and secrecy. Kleptocracy is a play in its infancy. Lin joined the cast and Gay in the rehearsal room, cutting and changing scenes until the last possible moment. It is no surprise, then, that the play is most successful in its experimental exploration of its characters, of how we understand—or fail to understand—Putin and his role in Russia’s network of corruption. As Geary breathes into Putin a glowing eccentricity that touches real-world political theatrics, Woertendyke’s characterization of Khodorkovsky visibly churns with the struggle to balance his ambitions and his image; each is a piece in a speculative puzzle. Audiences will not find answers to their political questions in Kleptocracy. The gleaming caricatures, though brilliant, do not reveal a decisive truth. Kleptocracy instead claims the more critical feat of questioning what we think are answers, of skewing the image we think we see. Kleptocracy makes ambiguity central and reveals more shadows than we ever knew existed.